Two nights ago, I went to my car to go to the store. 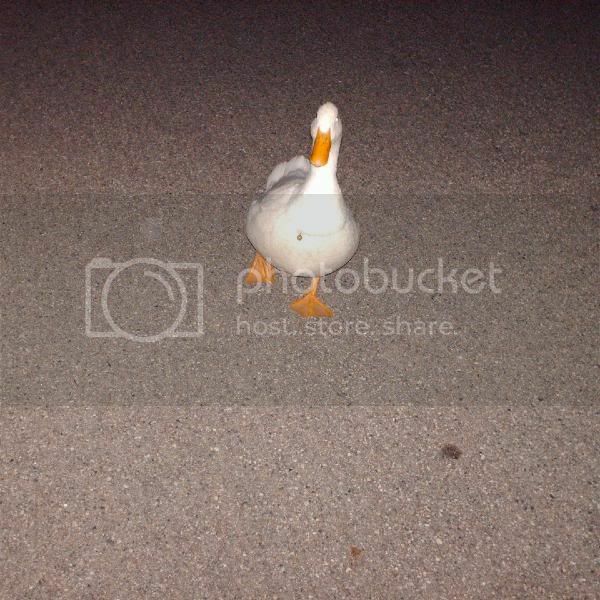 This duck was standing in the road at the end of the driveway. Notice the little bell around its neck? It belongs to some neighbors down the road we've never met. Duck wouldn't move. B tried doing the kissy noises you'd do to a dog or cat when you want it to come. And the duck went to him. So I decided to walk it home. It was making these grumbling noises under its breath. Grunting noises. Did you know ducks walk, er, waddle pretty slow? Yeah, they do. 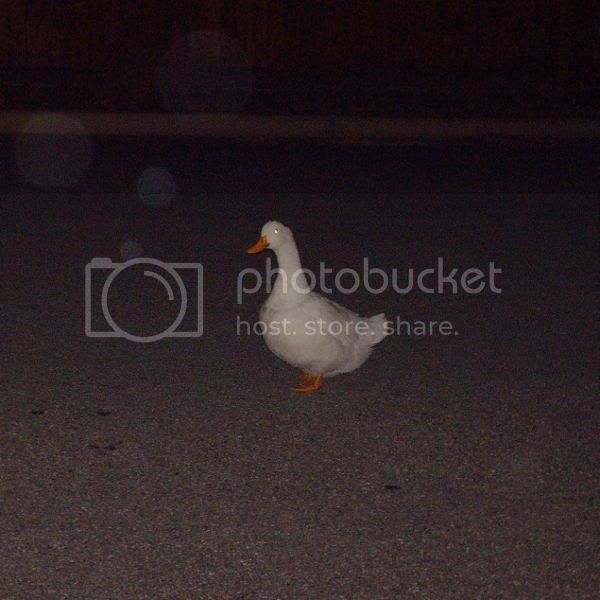 Anyway, made it to the duck's house and we stood in the driveway for a couple seconds. I was afraid it would follow me back home. 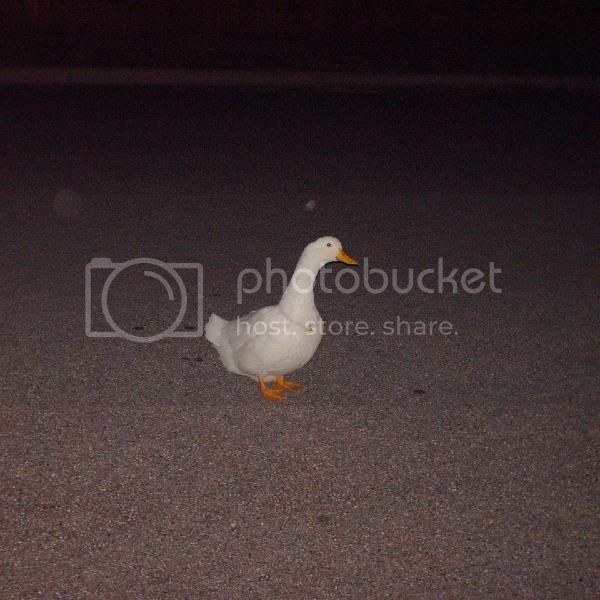 It didn't follow me but it did start quacking very loudly as I walked away. 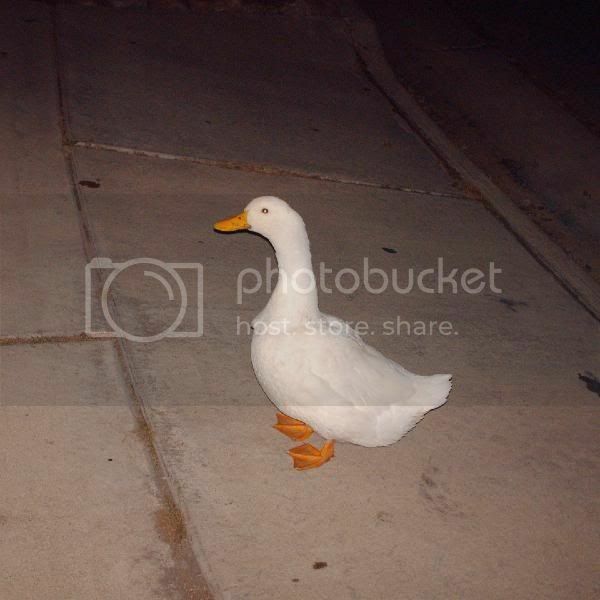 Anyone else have a pet duck? No pet duck here but we really enjoyed your pictures. Thanks for the Pay It Forward package. It arrived yesterday. I will be giving you a full report of my Pay It Forward activities soon! Thanks again!!!! We had two pet geese. We raised them from tiny little things... they were fun! We would swim together in the pond and they ate grass out of our hands and followed us around. If you squatted down and clapped and said, "Come here!" (like to a dog) they'd come running.